One of the best ways to explore wine (Is there a bad way?) is to find a winery or a winemaker you like and keep trying all the wines you can find from that producer. A good place to start would be David Ramey, whose Ramey Wine Cellars makes blockbuster chardonnay, pinot noir, syrah and cabs from Napa and Sonoma. His series of chardonnays, many of them single-vineyard, are unbeatable. Every time I open one up I know I am in for a real treat. His expertise doesn’t stop with chardonnay, though, and it doesn’t stop with his eponymous winery. 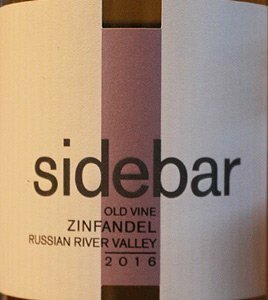 Take this Sidebar Zinfandel, for instance. 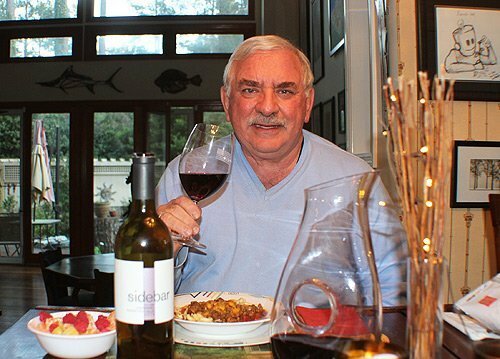 He and his wife Carla founded Sidebar Cellars about five years ago to explore different varietals and vineyard sites and have some fun. 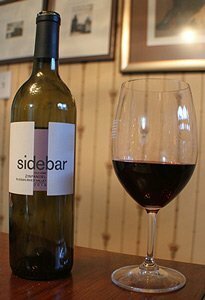 Lucky for us wine drinkers, we are having fun drinking Sidebar wines. My wife Teri and I opened a bottle of the Sidebar zin with a midweek dinner, and the wine really made the meal. The wine has all the flavors of a typical zin, but not quite as bold. That makes easier to pair with food. There was plenty of jammy plum and blueberry flavors with a splash of black pepper. The addition of 14 other varietals in the blend mellows it out a little. The wine is 78 percent zinfandel, 10 percent Alicante, 10 percent petite sirah and two percent other varieties that include sangiovese, carignane, trousseau, petite bouschet, syrah, beclan, tannat, peloursin, graciano, plavac mali, palomino and monbadon. Talk about a field blend. The wine is pressed and barreled before native malolactic fermentation. It is aged on the lees in neutral oak barrels for 12 months and bottled unfiltered. The grapes come from head-pruned 126-year-old and 66-year-old vines in the Russian River Valley. Winery: Sidebar Cellars was founded in 2014 by winemaker David Ramey and Carla Ramey, who already owned Ramey Wine Cellars. At their original winery, the Rameys focus on chardonnay, pinot noir, syrah and cabernet sauvignon. But David’s love of exploration in winemaking led to this new venture. It also allows him to focus on great vineyard sites for producing alternative varietals. The Rameys are having fun with this winery, stretching beyond conventional AVA borders and traditional grapes. They are exploring new and diverse varietal wines and unconventional blends. They say the reason for starting this second label is to have some fun and a little instant gratification while waiting for their Ramey bottlings to mature. Sidebar wines are fresh, bright wines meant to be enjoyed in their youth. Sidebar also produces a kerner and two sauvignon blancs. In the past they have made a rosé from syrah and a Rhone blend. I like one of the company beliefs that says life is for living, wine is for sharing, and harmony is essential to both. Goes with: We had this zinfandel with chili. Sometimes I like cabs with chili, but to me, the best pairing is with a zesty zinfandel. The Sidebar was up to the task of handling the spicy chili, with rich fruit flavors mellowing out the chili. And then when there was some wine left after dinner, it was very pleasant to sip on its own. This would be a great wine for summer grilling, as the fruit and spice array could match steaks, pork chops, pulled pork, chicken and even some fish such as tuna or salmon.